A guest staying at the Ngorongoro Conservation Area snapped these photos and shared them with Panthera, an organization devoted to big cat conservation. The pics were taken on Tuesday, and they show a five-year-old lioness nursing a leopard cub estimated to be just three weeks old. Incredibly, the lioness, named Nosikitok, seemed to be okay with the tiny interloper. It seems like a match made in heaven, except that it probably isn’t. The leopard cub’s future prospects look bleak, according to Hunter. “The natural odds are stacked against this little fellow,” he told AP, saying the cub will likely be killed by other lions who don’t recognize it as one of their own. And in fact, the cub was nowhere to be seen the day after the pictures were taken. Cross-species nursing among mammals is rare, but it does happen. Examples includesperm whales who adopted a deformed dolphin, a dog who nursed a baby squirrel, apes who treat cats like babies, and a domestic cat that adopted a trio of bobcat kittens. 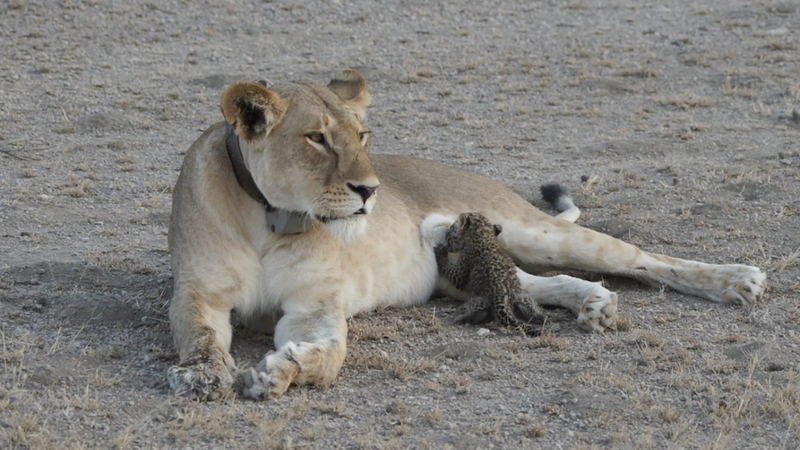 In this case, an orphaned cub being accepted by a potentially grieving lioness, it sure seems possible there’s some “mutual benefit” going on.